These blueberry no bake snack bites are the perfect snack for afternoon tea, for the lunchbox or as an extra with breakfast. I’ve used frozen blueberries in these, but they are frozen blueberries that we picked in January and froze ourselves. Yum yum! Can you stop at one? 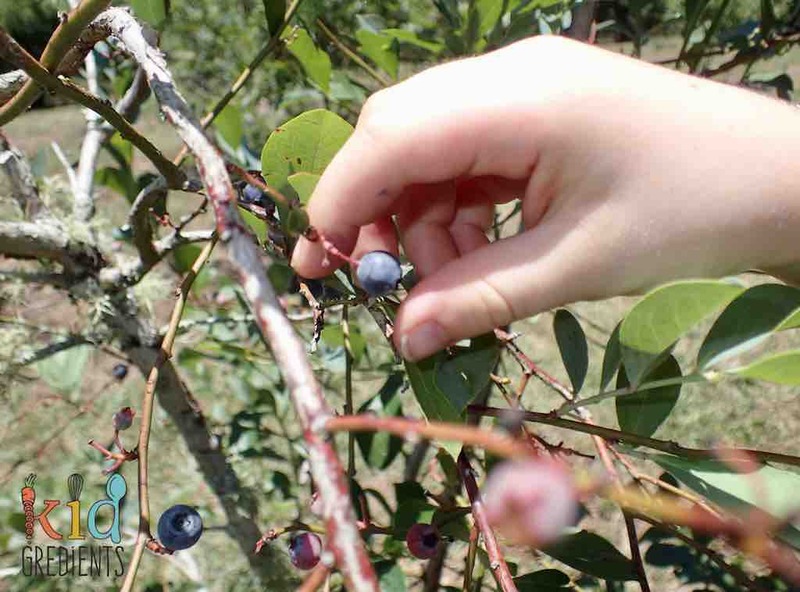 Back in January on a 38 degree day, we went blueberry picking near Waitui at Brackenridge Berry Farm. To be entirely honest we didn’t head out with the intention of blueberry picking. It was really hot… as in meltingly hot. 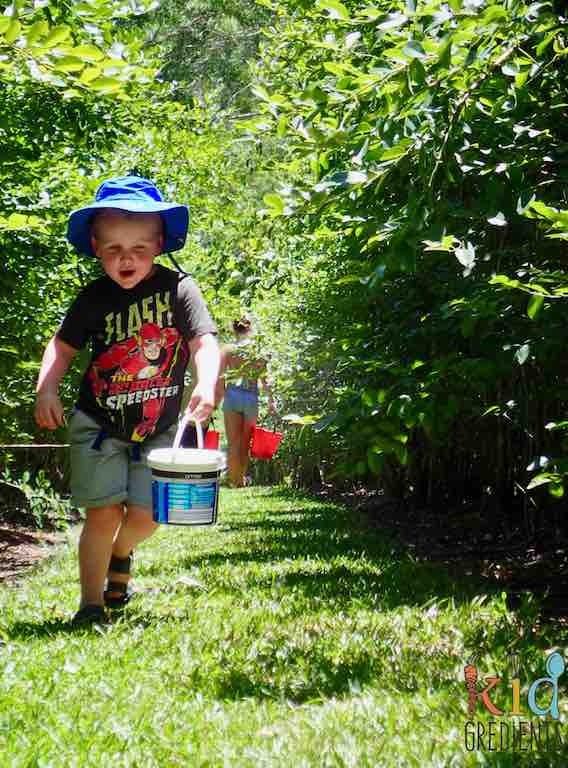 let’s go pick some blueberries! We were camping at Old Bar and had gone for a drive to see what we could find locally. We were intending to visit some waterfalls and have a swim, but en route we ended up stopping at a roadside cafe. That stop resulted in us hearing about a blueberry farm where another family had just been picking berries. 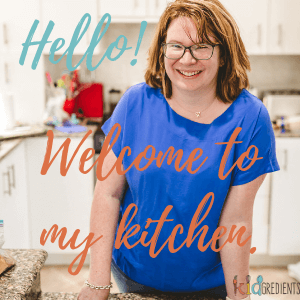 So what does a food blogger do? BLUEBERRIES! Now blueberries aren’t cheap in Australia, even in the height of their season…but we picked a whole bucketful for less than I’d spend on two punnets in the supermarket. 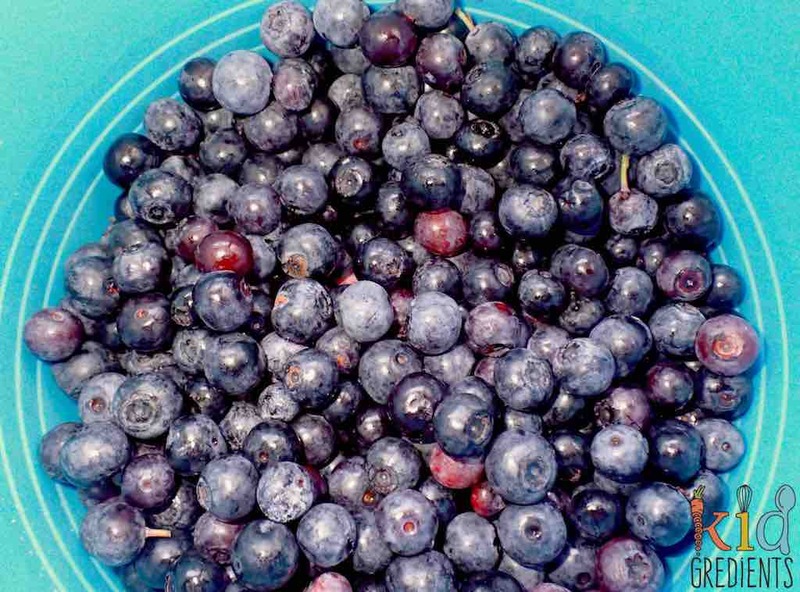 Yep, for $10 we got a bucket of blueberries. Now those blueberries, they got eaten by the handful. Look at that bucket full! Even Master 4 who wasn’t particularly keen on blueberries before picking started eating them (warm) from the bush whilst picking and was converted! Anyway, we ate stacks of them on the way back to the campground, but unrefrigerated blueberries start to spoil really quickly so I froze some when we got back. And I’ve just used them now…six months on! These blueberry no bake snack bites are the perfect pick me up for the afternoon, or great in a lunchbox! 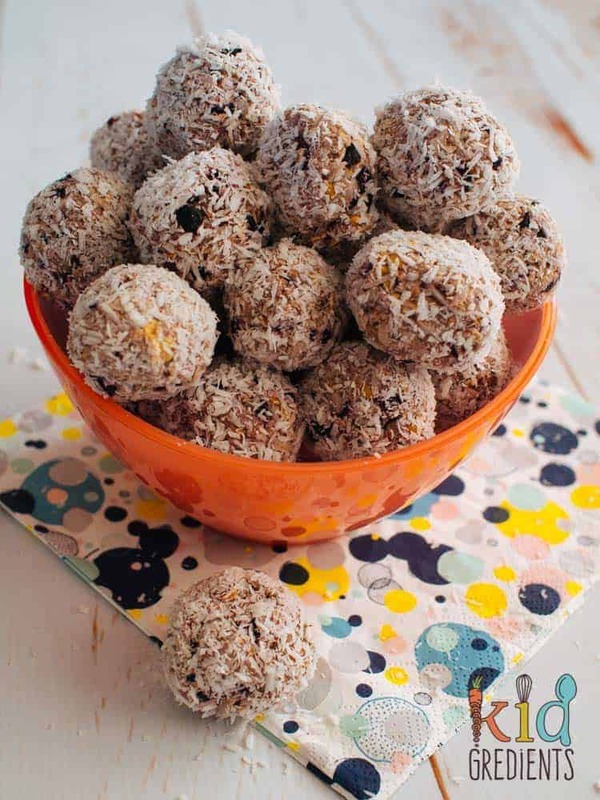 The recipe makes 24 and you can freeze some, they are great to pop straight into the lunchbox from the freezer. With stacks of healthy seeds and oats, they are actually a great way to recharge your energy levels! Blueberry and coconut makes a cakey taste without the extra sugar. These are dairy free and have only one tbsp of honey through the batch of over 20, so they aren’t sugar filled. Miss 6 is quite enamoured with them, having eaten a few whilst I was trying to take these photos! Blueberry banana bread, dairy-free and refined sugar-free! 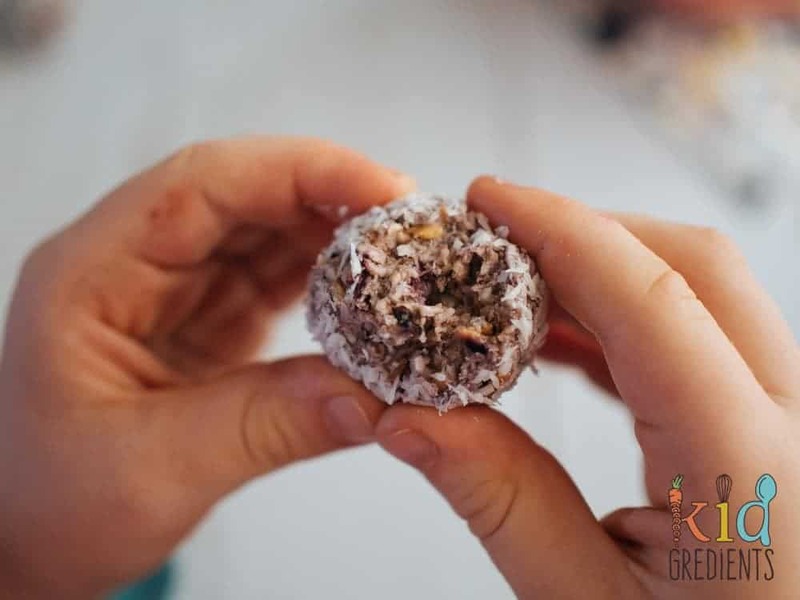 This delicious blueberry snack bites are the perfect afternoon pick-me-up, or great in the lunchbox or even for an extra bit of yum at breakfast time! 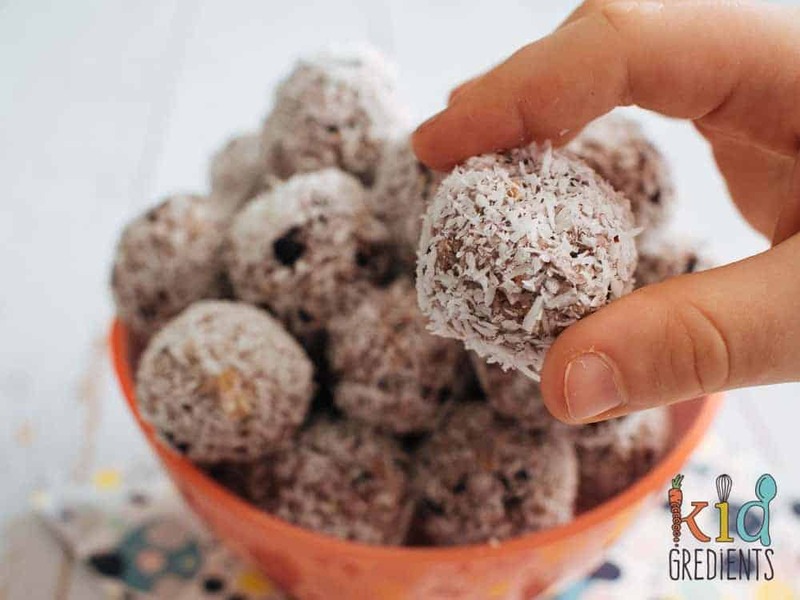 Super easy, dairy free recipe. No bake! Make them in only 15 minutes! First up, grab the blueberries and pop on the bench to defrost. Add the water to the chia seeds and the flaxseeds and leave for 10 minutes. Add the blueberries, oats, coconut flour, shredded coconut, honey and soaked seeds to the bowl of a food processor or blender. With wet hands, rolls into approx 20 balls. Keep in the fridge or freeze for easy grab and go. This nutrition information is generated using software. Please check with a nutritionist for any specific questions. Previous Post: « Unpredictable 4 year olds…and score some custom bobux sneakers! Need to substitute an ingredient? Want to know what appliances I used? Or need advice on why something might not have worked out? Check out our FAQS! Amazing recipe. My daughter loves blueberries and through your post, I got one more recipe that I can give her in her lunchbox. Thanks for sharing this interesting recipe. I would love to read more such recipes. I made these tonight, and half of the house likes them and the other half werent too interested. I find them to be nice, but coconut overkill. I really would have liked more of a blueberry taste and feel like these should be called “coconut bites”. I think next time id put in more honey or see how more blueberries go to make the coconut overkill more subtle. Glad half the household like them. I guess you can’t win them all. Good luck tweaking them, let me know how you get on! Can I use normal flour instead of coconut flour? you can,but normal flour needs to be cooked. 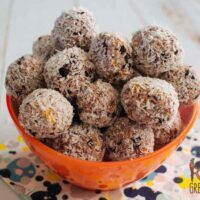 I would try to add some extra coconut or other dry ingredients. I was excited to see your No bake blueberry bar recipe but so disappointed when I saw it contains raw oats. This is like eating raw flour. Sorry but it is disgusting and gives me a huge belly ache. I don’t believe we should be feeding raw grains to our children. I would welcome a substitute. Actually, like with overnight oats, these are soaked in the juices of the blueberries and are therefore fine to eat. If you have a sensitivity to oats, perhaps try them with more coconut or even almond meal as a substitute. As you haven’t tried them, you should give them a go and let me know what you think then. What is almond meal? Can I just blitz almonds in my food processor? Almond meal is effectively flour made out of almonds. They need to be: boiled, skins removed and oven dried, then cooled before blitzing.